SAN JUAN CAPISTRANO, Calif. (BRAIN) — Interbike is revamping its Fit Symposium, which will be held for the second time this year, during the Interbike expo in Las Vegas. This year's edition will be curated with Medicine of Cycling, a group that organizes an annual academic conference in Colorado Springs. SAN JUAN CAPISTRANO, Calif. (BRAIN) — Interbike has signed up the Trombone Shorty & Orleans Avenue band to headline the Fall CycloFest festival at the U.S. National Whitewater Center, in Charlotte, North Carolina. 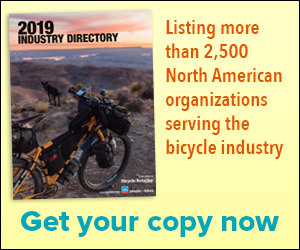 COSTA MESA, Calif. (BRAIN) — The National Bicycle Dealers Association will offer 16 new NBDA Super Seminars at this year’s Interbike expo, with sessions planned Sept. 20-22 at the Mandalay Bay Convention Center’s South Pacific ballrooms A and B.
SAN JUAN CAPISTRANO, Calif. (BRAIN) — Interbike says momentum is increasing for its new fall trade event in North Carolina, the Fall CycloFest. The event organizer announced Friday that Trek Bicycle is among the major brands committed to display at CycloFest. TORONTO, Ontario (BRAIN) — Emerald Expositions recorded revenue of $128 million in its first quarter this year, a 6 percent increase over last year. The company said the increase was due to acquisitions and organic growth. SAN JUAN CAPISTRANO, Calif. (BRAIN) — Registration is now open for all retailers, distributors and media planning to attend the 2016 Interbike Expo in Las Vegas. SAN JUAN CAPISTRANO, Calif. (BRAIN) — Interbike plans a new showcase area and dedicated neighborhood on the show floor to help raise the profile of domestic manufacturers. SAN JUAN CAPISTRANO, Calif. (BRAIN) — Interbike has redesigned its website to provide a user-friendly experience with improved navigation and functionality. SAN JUAN CAPISTRANO, Calif. (BRAIN) — Interbike will work with the North Carolina Cyclo-Cross organization to produce a 'cross race at this October's Fall CycloFest in Charlotte, North Carolina. SAN JUAN CAPISTRANO, Calif. (BRAIN) — Interbike announced that SRAM, Cannondale, Santa Cruz, Fox Racing, Pivot and KHS are among the brands that have committed to exhibiting at its new event next fall called CycloFest. SAN JUAN CAPISTRANO, Calif. (BRAIN) — Interbike and Bicycle Retailer and Industry News will host the third annual Turkey Pedal industry ride and food drive on Saturday, Nov. 14. LAS VEGAS (BRAIN) — For your Friday night prime-time viewing pleasure, Universal Sports Network will premiere a one hour show about this year's Interbike. Interbike 2015 – the TV Show is set to premiere Friday at 8 pm EST. It will be repeated on the network several more times over the weekend and next week.